← Flo and Laser’s first time swimming. I don’t like making “newbie” mistakes but that’s what I get for not doing my homework before making decisions. 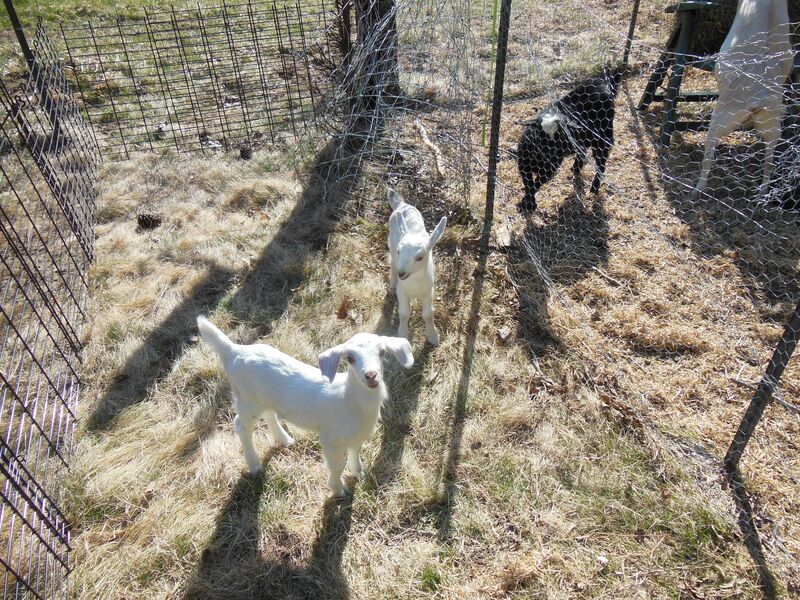 Four days after we bought our first two goats I saw an ad on craigslist for Nubian/Alpine kids from an organic dairy. They advertised that their kidding season would begin soon and they would keep a list of people who wanted to buy the babies. I quickly emailed and became #5 on the list for one doeling. About a month later, after we were the owners of 4 goats, I remembered to tell my husband that I wanted just one more goat, a bottle baby. He thought that was fine. I emailed once, around the second week of March, but no babies had been born yet. Then, just last week (March 25th), I emailed again and was told that they had several doelings born already who were 1/2 Saanen and I could come anytime to pick one out. I was thrilled at this prospect after just having read a little more on the Saanen breed. They have excellent milk production and calm dispositions. My mom was visiting at the time and I got the email in the afternoon. We had taken our chairs down to the river to sit in the sun. I couldn’t relax though and I mentioned how much I really wanted to just jump in the car and go get my “pick of the litter”. She responded enthusiastically enough that we quickly folded our chairs and leaned them on a nearby tree and zipped around getting some things ready so that as soon as my boys got home from school we could begin the 2 hour drive. I called the farm to let them know I was coming. I didn’t get a hold of anyone and decided to just go anyway. They had said, “come anytime” and I was hoping that they were just outside busy with the innumerable chores they probably had. We enjoyed a gorgeous drive up the Methow Valley in Northern Washington State and arrived at 6:20 pm 7 miles north of Twisp at Sunny Pine Farm. We were welcomed by an extremely laid back gentleman wearing a funky hat that made him look like he had thick spikey hair. This was not a surprise because the Twisp area is known for it’s hippy-types. We were directed to the bottle baby pens and looked in on maybe 10 or so 3-9 day old doelings. Most were white or lightly colored. I had a really hard time choosing between two of them and as we were leaving I mentioned to my mom how close I was to just buying them both. But, alas, I did not want to ask my husband for yet another goat and thought it would be best to just “stick to the plan”. I also was counting on having Saraphine, our 6 month old Dwarf Nigerian, bunk up with our new one. It seemed like such a short drive to get home. 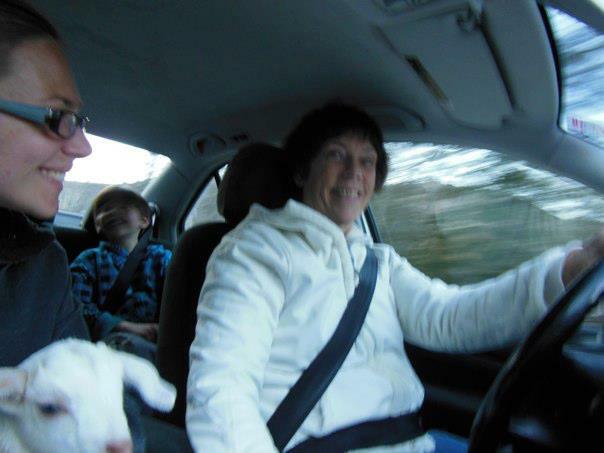 Riding in the car with a baby goat is fun. We brought towels to catch any accidents. I named her Piper and she slept most of the way home. We were home just before 9pm. I did not have the spot ready for Piper and I also began to realize that I wouldn’t be able to leave her alone for the night. She was just so tiny and needed someone to cuddle with. It really didn’t seem like a good idea to try to introduce her to Saraphine so soon. My husband was already in bed and complaining that I was keeping him up so I handed him the goat and said go to sleep with her while I got ready for bed. I had found out on the ride home that she didn’t pee when she was laying down. 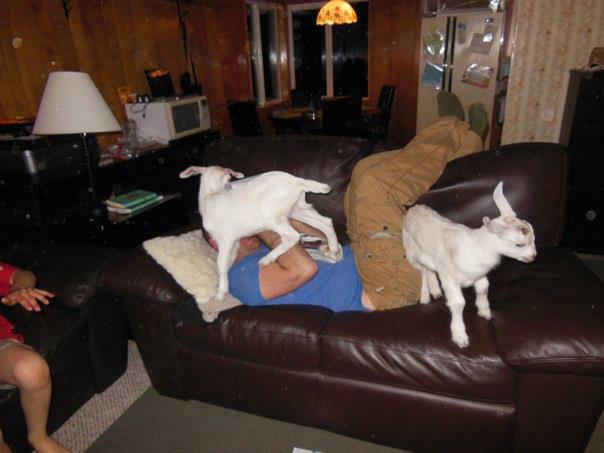 So, that night we slept with a goat. Sleeping with her actually turned out well. She woke up at 1:40 am and I got up with her and brought her to the bathroom where I had put towels down for her to pee on. While waiting for her to do that I began researching what it took to raise a bottle baby kid. (I know, I know, totally “cart before the horse”.) She apparently didn’t need to go and so we went back to bed. She slept through the rest of the night and didn’t actually go pee until around 7:00 am. This she did on the towels like a good girl. The next morning as my husband was getting ready for work I began to feel a little panicky about what to do with this single kid. I was worried because the only solution I could think of was to go back up to Twisp and buy her a little buddy. Saraphine was too old to be a companion. Piper would need a warm spot in our feed room and Saraphine would climb the walls in boredom in there. She didn’t sleep nearly as much and needed more space. I passed these concerns on to my dearly beloved and he told me to just do what I needed to do. While drinking my morning coffee I wrote a plea for advice in the goat forum of Homesteading Today. I wanted to know if it would be better to live with the kid I had and take her everywhere with me or get back in the car and buy another one. It was pretty unanimous that everyone thought I should get back in the car. When my mom got up I told her of my realizations and that I should have brought home two babies instead of just one. She was actually game for another 4 hour car trip and we decided to keep my boys home from school and have another adventure. I rushed around and did my chores, skipped my shower and we headed out by 8:30 or so. Once again, the drive was absolutely gorgeous. I had called ahead to the dairy but once again hadn’t actually spoken to anyone until we arrived. There were no issues with us buying a another goat so I picked out the one that had been my second choice the day before. Now they both live happily in our single bathroom. They are surprisingly un-messy. They really don’t poop a lot and when they do it is simple to pick up the tiny lumps. They also seem to pee in a corner and so I put towels there and towels in the other corner where they sleep. However, if you need to go to the bathroom and they are in there it is rather difficult to concentrate on your “business” whilst baby goats chew your belt and try to jump on your lap! My husband told me this morning he had one biting his achilles tendon and the other biting his toe. They go outside anytime it is over 60 degrees into a little yard I have set up next to our other goats. I do plan on setting them up a spot in our feed room, I just haven’t had the chance yet. So, dear reader, either laugh at me or learn from my mistake. Bottle babies need buddies. 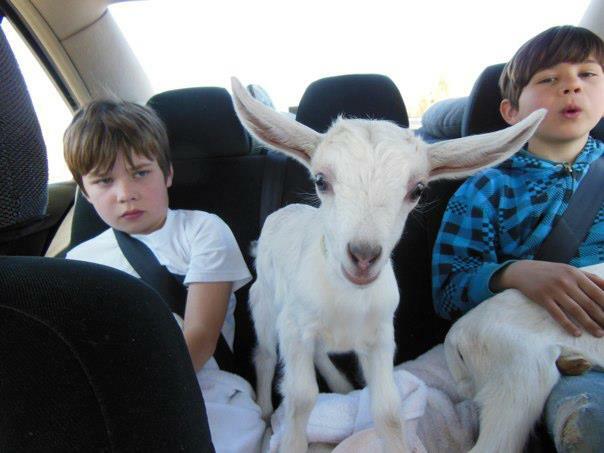 This entry was posted in Goats, Happenings and tagged bottle baby kid, goats, newbie mistake. Bookmark the permalink.